We went to Ttukseom Resort (뚝섬유원지) to do something winter-ish. It was my first time to visit the place. I wasn’t expecting that much because when it says “resort”, I just thought it is just like any other parks in Korea. What is good about Ttukseom Resort is that, every winter, they hold a “Snow Flower Village” program in the area. What you can basically see there during winter are the sleigh hill, mini rides, and whatnot. It’s something kids would love to go to. Since we are kids at heart, we decided to give it a try because we were after the sledding hill. However, we arrived at the resort at around 5 pm and the guard won’t allow us to enter anymore because they were about to close that time. We were all so disappointed because we traveled so far just to go to the place. Prior to that, we actually went to the World Cup Olympic Park to try ice skating. Unfortunately, we arrived at the dismantled skating rink because apparently, it was the last day of the ice skating event of the park. Since Ttukseom Hangang Sledding Hill is just near the area, we still have hope to enjoy some winter activities, so we just went there anyway. Much to our dismay, we were greeted by the closed gate of the sledding hill. The good thing about Ttukseom Resort is that, it’s not just all about the Snow Flower Village. It’s everything fun compressed into one area. When you go out of Ttukseom Resort Station which is Line number 7 of the subway, you can go to different places within the area to relax and enjoy the scenic view seeing that it is located right in front of the Han River. 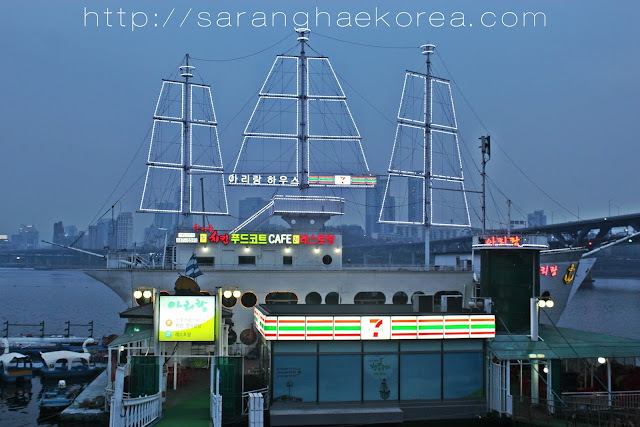 In the southern part of the resort, near the sledding hill where we supposed to have fun, we found a ship-shaped building anchored offshore of the Han River. It is called Arirang House (아리랑하우스). It is a combination of a house, a restaurant and a café. 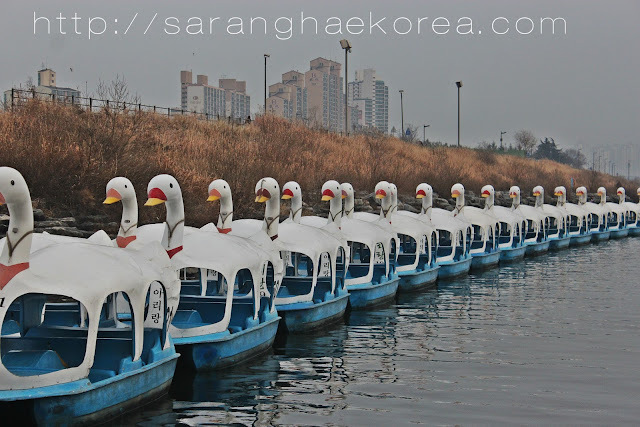 What brought us to this place are these swan boats which are actually available for rent. 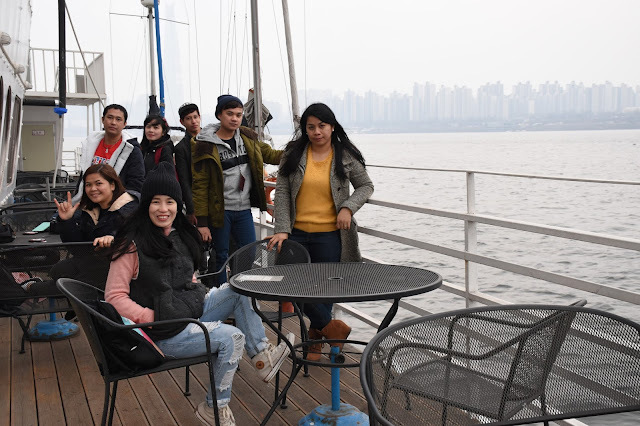 We decided to try it out, but we just realized that it’s winter, some parts of the river is frozen and, who would sail on a swan boat in the middle of a freezing winter? So again, the frustration was eating us. Good thing that the Arirang house was open that time seeing that it was a holiday. We just went their instead to relax and chill out after a long tiring day of traveling and walking. Inside the Arirang House, you can either order something to eat or something to drink. Oh wait, did I mention it’s a restaurant and a café? Well, anyways, since it’s too early for dinner, we ordered something to drink so we could get in and see what’s inside the ship, I mean the restaurant, I mean the café, I mean the house, I mean…. Whatever. It’s a combination of everything actually. I like what’s inside the ship, it feels like cruise-y. Not that I have tried cruising before, but at least I know how it looks like. There are several Korean customers that time, most of them are couple, probably dating. Yeah, dating inside a ship, because in fairness, the ambiance is very romantic. 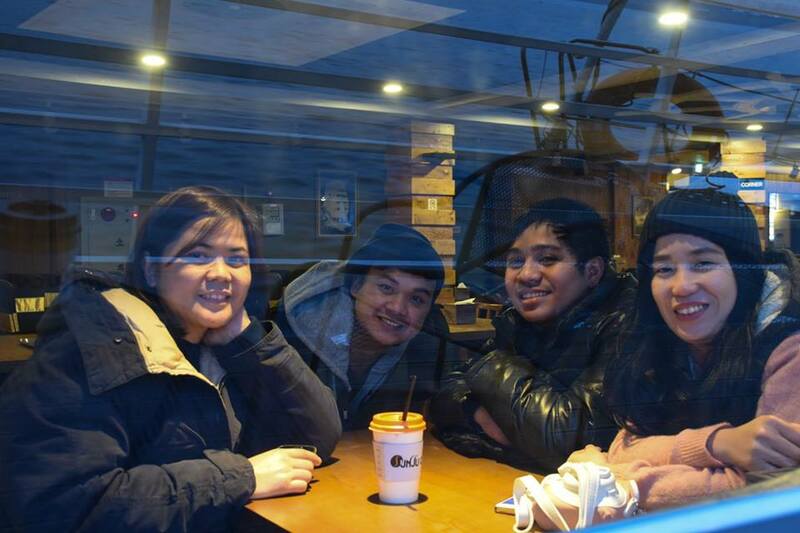 You can talk and sip some coffee while overlooking the freezing Han River outside. I guess it’s a good place to hang out during summer. Outside the café inside the ship (I hope I didn’t confuse you with this), they also set some chairs and tables should anyone want to breathe some fresh air. It was so cold that day, so nobody dared to stay outside, except us. It was windy and cold but relaxing. The area could be a perfect spot during a hot and windy summer day. I don’t know, but somehow, I find the place romantic. I also love it when they played not only Korean music but also new English music. Seldom you can hear Maroon 5, Troye Sivan and Justin Beiber on Korean’s coffee shop. 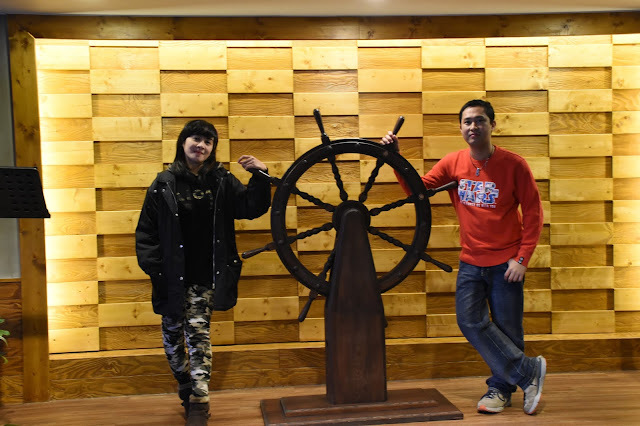 The lightings inside the ship is also relaxing, which make it even more ideal for dating couples. If I am going to rate this café/restaurant from 1 to 10 with 10 being the highest, I think I will give it 7. If ever you’re in Ttukseom Hangang Park, try to locate the Arirang House if you want to chill and relax. You can easily spot it, just look for the swan boats or a ship anchored offshore, you won’t surely miss it.